Height adjustable with marked peg holes from 30-37 inches. 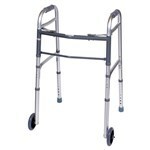 The walker folds for easy transport and the sides are detachable for storing in tight spaces. FGA87100-0000 Features: Easily Folds For Transportation, Marked Peg Holes For Easy Adjustment - From 30-37 Inches, Wheels Offers Assistance While Walking, Sides Detach For Storing In Tight Spaces"